Rapid Support Forces display disarmed weapons during Sudanese President's Omar al-Bashir visit to the war-torn Darfur region at Rapid Support Forces Headquarter in Umm Al-Qura, Darfur, Sudan, Sept. 23, 2017. The United States has lifted long-standing economic sanctions on Sudan, citing the country's progress in human rights and counterterrorism. Friday's announcement by the State Department comes after what officials say was a careful review of Sudan's positive actions since January and a "focused, 16-month diplomatic" effort between the U.S. and Sudan. The lifting of sanctions is "in recognition of the Government of Sudan's sustained positive actions to maintain a cessation of hostilities in conflict areas in Sudan, improve humanitarian access throughout Sudan, and maintain cooperation with the United States on addressing regional conflicts and the threat of terrorism," said State Department spokesperson Heather Nauert on Friday. The sanctions were first imposed in 1997 after the U.S. labeled Sudan a state sponsor of terrorism for allowing al-Qaida leader Osama bin Laden to live in the capital, Khartoum. Further sanctions were added in reaction to allegations of human rights abuses carried out by government forces against ethnic minority rebels in Sudan's war-torn Darfur region. The move announced Friday takes effect October 12 and will unfreeze assets, remove financial restrictions, and suspend a trade embargo. But the U.S. will continue to block assets and property of Sudanese citizens involved in violence in the Darfur region. The U.S. will also continue to engage and apply pressure as necessary to discourage backsliding and to encourage further cooperation and progress toward peace and stability in Sudan and the region, according to the State Department. And while Sudan does not have diplomatic relations with North Korea, U.S. officials said the government of Khartoum indicated it will "not pursue an arms deal" with Pyongyang. "We will closely monitor the situation.We have zero tolerance," said a senior administration official, noting Sudan is expected to fully comply with United Nations resolutions against North Korea's weapons proliferation and nuclear provocation. Former U.S. President Barack Obama temporarily alleviated some penalties that had been in place shortly before he left office. The sanctions relief under Obama was said to be in return for an improvement in regional conflicts and humanitarian access. FILE - Sudan's President Omar al-Bashir addresses supporters during his visit to the war-torn Darfur region, in Bilal, Darfur, Sudan Sept. 22, 2017. Sudanese President Omar al-Bashir's government was accused by International Criminal Court of carrying out genocide linked to the Darfur conflict. U.S. officials said Darfur-related sanctions against Sudan would remain in place after today's announcement. In July, the Trump administration postponed for three months a determination on whether or not to completely lift the sanctions.The deadline of this decision is October 12. Rights groups argue the Trump administration should create a completely new policy framework to address the core issues that led the regime to be sanctioned in the first place. "The focus should be on promoting fundamental human rights and religious freedoms, countering grand corruption, and achieving peace in Sudan's various war-torn regions," said John Prendergast, founding director of the Enough Project, an advocacy organization that supports peace and an end to mass atrocities in Africa's deadliest conflict zones. Prendergast added a new policy framework on Sudan should include serious leverage such as "asset freezes targeting a network of individuals and entities." Some U.S. lawmakers are asking the Trump administration to include a provision for victims of terrorism as part of the sanctions relief package, holding Sudan accountable for materially supporting international terrorist attacks. 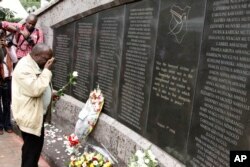 FILE - An unidentified man lays flowers at the US Embassy bombing memorial site in Nairobi, Kenya, Aug. 7, 2013. Sudan had provided a safe harbor to al-Qaida militants in the years leading up to the terror group's 1998 bombings of the U.S. embassies in Kenya and Tanzania. American victims have since filed lawsuits against Sudan, with courts finding Sudan legally responsible for supporting those terrorist attacks. The Sudanese government has not paid any compensation to American victims. A senior U.S. official told VOA "this is a very important issue. We are going to urge Sudan to address these claims. 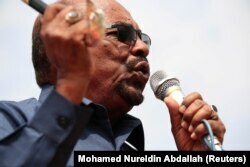 Sudan wants to move towards more normalized bilateral relations. Our increased engagement with them and clear desire on this gives us leverage on this." In a recent letter to Secretary of State Rex Tillerson, Chairman of Senate Judiciary Committee Chuck Grassley and Chairman of House Judiciary Committee Bob Goodlatte urged Washington to ensure a binding commitment from the Sudanese government to meet its obligations to compensate American victims. "Anything less would violate longstanding United States policy, undermine our nation's counterterrorism and victim compensation laws, negate the efforts of the victims who have fought for justice in federal courts, and reward Sudan for its prior support of international terrorism," wrote Grassley and Goodlatte. The State Department's 2016 Country Reports on Human Rights Practices credited the Sudanese government for starting "a national dialogue process aimed at solving the country's internal political and social challenges. "But it the also cited Khartoum for "obstruction of humanitarian assistance, restrictions on freedom of speech, press, assembly" and "intimidation and closure of human rights and nongovernmental organizations" in Sudan.